Exit is a music festival which is held annually at the Petrovaradin Fortress in Novi Sad, since 2000. It is considered one of the biggest music festivals in South Eastern Europe. In 2007, the association of seventy biggest European festivals declared the Exit the best festival of the year. Annually, in mid-July, this festival brings together numerous international and local music stars to perform in over twenty different stages, which are mostly classified according to the the genre of music. Exit supports a large number of social campaigns, as well as campaigns in the local community. State of Exit Foundation is a foundation established in 2010 with the aim of supporting the reform of higher education in Serbia. Cinema City is an International film festival which is annually held in Novi Sad. During eight days, Novi Sad becomes a city-festival, with rich film, music and academic programme. The programme concept of the festival includes three segments: Cinema City films, PRO section and Cinema City music, which take place in 10 attractive locations it the city. Within the Cinema City films programme, during the festival, more than 100 independently produced films are screened. Special attention within the film programme is given to promotion of young film-makers from the country, region and the world. Novi Sad Music Festivities (NOMUS) is a festival created in 1975, based on the idea of prominent cultural worker Anton Eberst. Soon after the founding of the festival, it has grown into a central music event of Novi Sad, due to the fact it represented the most successful achievements of Yugoslav performers and composers. Therefore the NOMUS has gained both the respect of visitors and respect of its participants. Today, thanks to the Music Youth of Novi Sad, this international festival of classical music is focused mainly on chamber music concerts. This means that this event is mostly dedicated to smaller, but diverse groups in terms of the different instrumental combinations. It is now a custom, continuously maintained since 2000, that citizens of Novi Sad and their guests to look forward to the Festival of Street Musicians in late summer, which brings multitude of artists from the international scene on the streets of the city. For them, street playing and performing on streets is a lifestyle, but it is also recognised as art form that has its own festivals and other ways of expression all around the world. Since the beginning of the new millennium, Novi Sad has been the host of street art, and it is visited by the most famous street musicians of the world, who are performing at other prestigious festivals in Europe and beyond. In this way they bring culture and spirit of their environment, so they could share it with local street art lovers and with other artists. Novi Sad hosts the only International Festival of Alternative and New Theatre in Serbia – INFANT, which has become a meeting point of creators who see theatre art in a new and a different way. This is the only festival of its kind in the country, and it is authentic and highly respected in other European countries, among artists and critics who follow latest trends in the field of theatrical creativity. Days of Brazil – samba carnival of Novi Sad, which has existed since 2010 in Novi Sad, and has brought together the culture of Brazil and thousands of people in past few years. Going to the festival has become a must for all those people who love Brazil and who don’t live far. Capoeira workshops, samba dance, samba percussion, exhibitions, screenings, concerts, parties and recognisable carnival parade are the main part of the program that makes this festival attractive for visitors from all around the world. These free programs are held in 7 locations in collaboration with experts, but they give opportunity to the curious who want to try out new skills. International Festival of Prose – PROSEFEST was founded with the intention to bring literature back to its roots – live and direct contact between authors and readers. During the festival, eminent domestic and foreign authors read their works in public rooms, they go to high schools and faculties, where the literature is studied within curriculum, and have discussions with pupils and students about topics they selected together. Sterijino Pozorje was established in 1956 as a permanent festival of national drama and theatre of competitive character, within the celebration of the 150th anniversary of the birth and the centenary of death of the great Serbian comedy writer Jovan Sterija Popović. 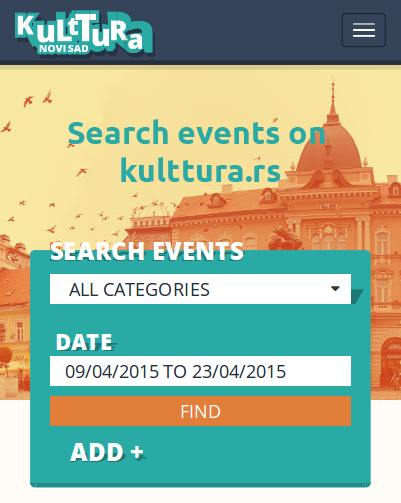 Since then, Sterijino Pozorje has organised the theatre festival every year, which is held in Novi Sad in late May. The repertoire is based on selection by three-member jury lead by an art director. Festival participants can be professional theatre groups from the country and abroad with plays based on texts by domestic writers, as well as domestic theatres with plays based on texts by foreign writers. Novi Sad Jazz Festival is highly ranked on the list of European jazz festivals because of its high quality content, manner of preparation and realisation. It has already become the preferred destination for the most eminent musicians from our country, Europe and the world, and for the audience that shows increasing interest and arrives from other cities. The specialty of this international festival is that it presents mainly original music. The main programme consists of the most successful domestic jazz ensembles and the most prestigious names in the world jazz scene. Festival programme includes publication of books, compact discs and video clips. International Novi Sad Literature Festival was founded in 2006 by the Association of Writers of Vojvodina in order to promote contemporary literature, to create direct contanct with the word of a writer, as well as to introduce important writers of the country and the world, and the with idea that there is a need for affirmation of Serbian culture, and especially culture of Vojvodina and Novi Sad. EURO-IN FILM is the festival of European film culture and art that promotes novelties in European and independent professional film. It is an open festival that welcomes all fans of European and independent film to constructive cooperation.